The latest release from the Medill Local News Initiative at Northwestern is another strong indicator of a changing perspective among many leading publishers. 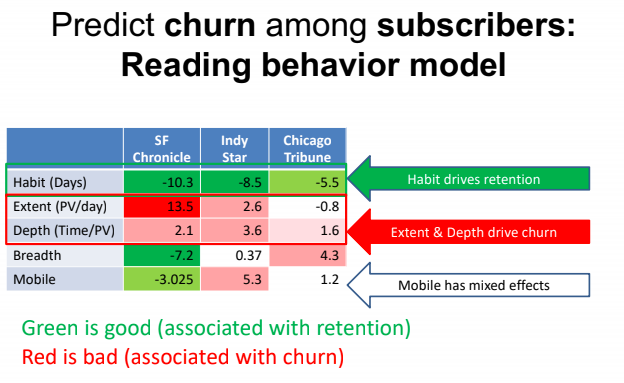 In a study of over 13 terabytes of subscriber data from the Chicago Tribune, Indianapolis Star, and San Francisco Chronicle, they found that regular reading habits were the most strongly correlated with subscriber retention, more so than even time spent or number of stories read. In short, frequency is more important for retention than extent or depth. We know that leading publishers invest more in engagement than acquisition. By prioritising engagement, publishers are focusing more on the development of a habit for news readers (=frequency) rather than just the number of page views (=extent). Still, a harmony with your acquisition strategy must be found. Publishers must prioritise quality acquisition over a focus on acquiring digital subscribers at any cost (such as through deep discounts), which can lead to an unacceptably high rate of churn. The study also identifies a “puzzling surprise”: subscribers who read many stories each visit (and read them thoroughly) are no more likely to keep their subscription than readers who just skim — and in fact, in some cases the higher rates of story reading and time spent were more associated with greater churn. The researchers did not find why this paradox exists, and state that they believe more research will be required. However, based on our own research during the Digital Reader Engagement project, we can start to formulate an answer for this paradox. We found there are three main types of readers, what we have called the scanners, regulars, and long readers — this is how we segment in our EngageReaders dashboard. From a further analysis of this data, we see that for example a daily newspaper having 29% of its scanners as core readers, while only 25% of total core readers are long readers. Each reader segment has its own associated reading behaviour, so it is important to compare the impact of time spent reading and depth of articles read within these frames. Scanners may only have five minutes a day set aside for news, so even if they are not reading for as long or as many pages as other reader types, they can still be highly engaged with the content. A key message though is that “skimmers” and “scanners” can still be a valuable reader base, so publishers need to examine how they can best serve the needs of such readers. One format we expect to see much more of this year is the story format (as seen on Instagram, Facebook, and Snapchat), and indeed Reuters predicts this format will surpass feeds as the main way people share news with friends within the year. We’re planning a deep dive into this format and how publishers can succeed with it, get in touch if you have thoughts or questions to contribute! Truly local news is a key component of news that helps develop daily habits. Spiegel Research Director Ed Malthouse identifies this as “differentiated content” that provides the local context for readers, helping publishers separate themselves from the onslaught of free news available online. Publishers are beginning to learn this as well, with a switch away from “commodity news” to the local news that readers cannot get anywhere else. Newsletters are also an effective way to develop habits, something we have covered extensively before. While until now newsletters have mainly offered customisation (the ability for recipients to opt-in to specific topics to follow), the study identified true personalisation (newsletters created for readers based on past behaviour) as an idea with “vast unrealised potential”. Researchers proposed that in the future the hyper-personalisation offered by these newsletters could even become a paid subscription-only offering. The importance of this opportunity is something we identified with The Times and The Sunday Times back in 2017, which is why we launched “JAMES, Your Digital Butler“. We’re excited to release further insights from this year-long experiment soon. We believe 2019 will be the year publishers realise the importance of habit formation for their digital news readers. That’s one of the reasons why our newest research will focus exclusively on how exactly to develop habits. With this new research as well, we see that a focus on frequency and habit development must be the path forward for leading publishers.